When I speak about Ethiopia, I face this impossible task to tell the story three thousand years long. There are many wonderful books and websites to learn Ethiopian history -- I have to find a better way to organize it. In fact, I plan to put on this site my notes for the class ANTHR 303 I taught last year. The general outlook of Ethiopian history is a plan for the future, right now read about the Battle of Adwa, fragments from the book Anatoly writes (H.I.M. ), historical facts for the chapter "Birth of Tafari." (On the right: Trinity Cathedral in Addis Ababa build by the Italian POW after Menelik's victory at Adwa). There is new History Directory @ Sellassie Cyber University. All new pages are there. If you have Ethiopian history pages, send us your link -- sellassie@angelfire.com. If you want to stay updated about the changes at Sellassie WWW, subscribe to our Sellassie List. If you want to contribure, contact us. 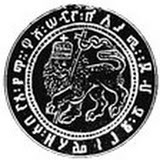 For a full listing of Solomonic dynasty since 13th century, please go to Regnal Chronologies Website with the royal lines of the world. Here are only three emperors before H.S. The father of the present size Ethiopia. 1996 was a centenial of Adwa victory, the first war with Italy and the first victory over European power, which put Ethiopia back on the big history map. Did you see From Tafari to Haile Sellassie and 1930 pages? Ethiopian History Links? See other History Pages!